Growing up in New Zealand in the 80’s we never got to go trick or treating. Mainly because Mum thought it was something “only Americans do” but also because no one in our neighbourhood got into it either. Despite this, we’d still chant “trick or treat, smell my feet, give me something nice to eat!” for the month of October (much to Mum’s annoyance), until she finally gave in and handed over the sweets. These days Halloween is much more celebrated in New Zealand and no doubt we’ll have trick or treaters knocking away at our door in a few days, much to Chewie’s delight! 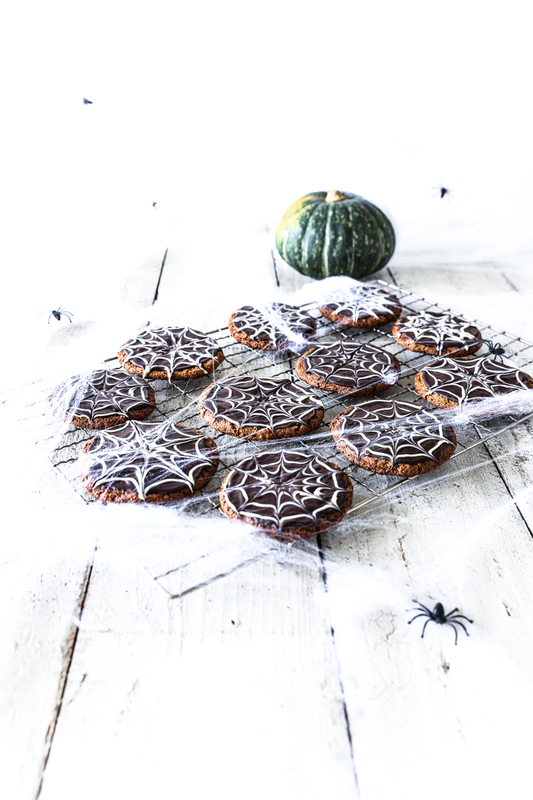 So this year I’m joining in the fun with these Trick Or Treat Halloween Spider Web Cookies! But are they are a trick or a treat?! 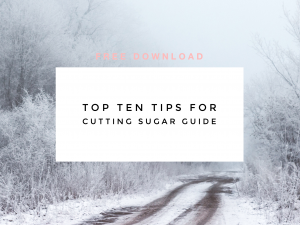 For starters, they’re a deliciously soft, dairy, grain and refined sugar free cookie, made with almond butter and the rather “tricky” sunflower seed flour. If you haven’t come across sunflower seed flour yet, it’s simply finely ground sunflower seeds and is sometimes also called sunflour. Why is sunflower seed flour “tricky” you ask? When you combine sunflower seed flour with baking soda in baked goods, something rather interesting happens. If you leave your baked goods for a couple of days you’ll begin to see greenish blue spots, which initially look like mould! On closer inspection, however, there’s no furriness typical of mould, and that’s because it’s actually a chemical reaction between the two ingredients that creates the colour. 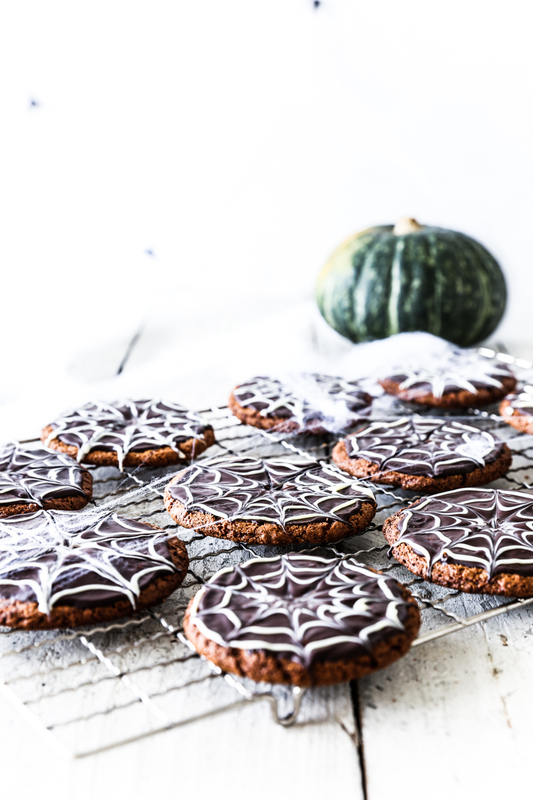 Perfect for a Halloween cookie right?! The question is, are you feeling tricky this Halloween? 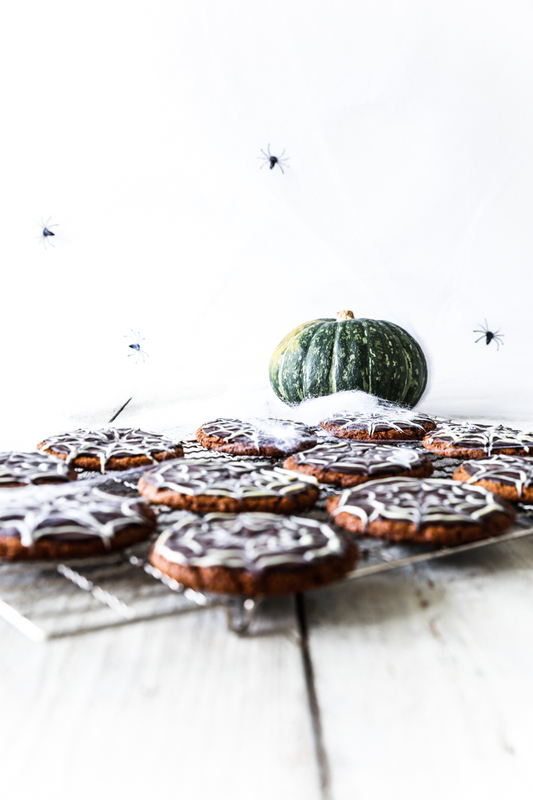 If your answer is yes, be sure to make these cookies a good few days before Halloween so that your unsuspecting trick or treaters will get a tricky surprise in the middle of their delicious treat. I’ll leave it up to you whether or not you tell them what they’re actually eating. Preheat the oven to 170ºC fan bake and line two oven trays with baking paper or mats. 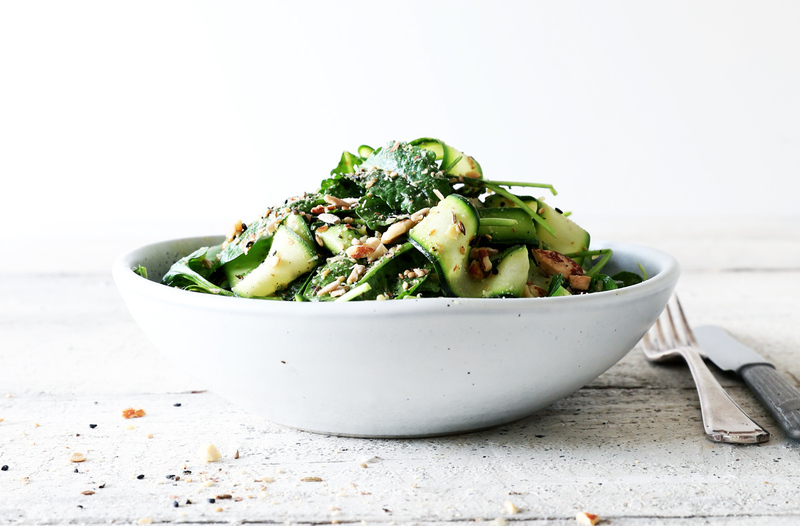 Combine all the ingredients in a food processor and pulse to combine. Alternatively, combine all the dry ingredients in a bowl and stir well. Combine all the wet ingredients in a separate bowl and mix well, then add the wet to the dry and stir together until evenly combined. Drop spoonfuls of mixture onto the lined baking trays and form into round cookie shapes. No need to flatten as they do so on their own in the oven. Bake in the centre of the oven for 10 to 12 minutes, or until the cookies have turned a golden brown and feel set when pressed lightly. 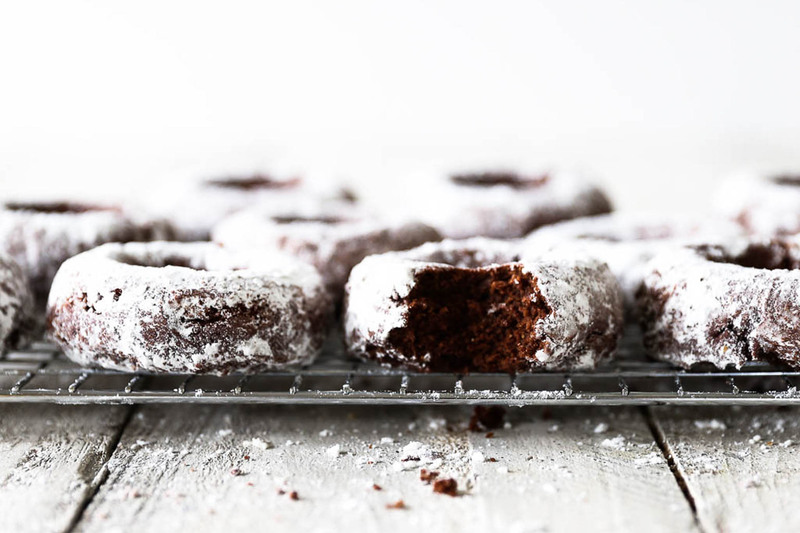 Remove the cookies from the oven and allow to cool on their trays for at least 10 minutes, before transferring to a wire rack to cool completely. Melt the dark chocolate either in a heatproof bowl set over a pan of steaming water or in the microwave. Drop a spoonful of melted chocolate on top of each cookie and use a spatular or flat knife to spread out to the edges. 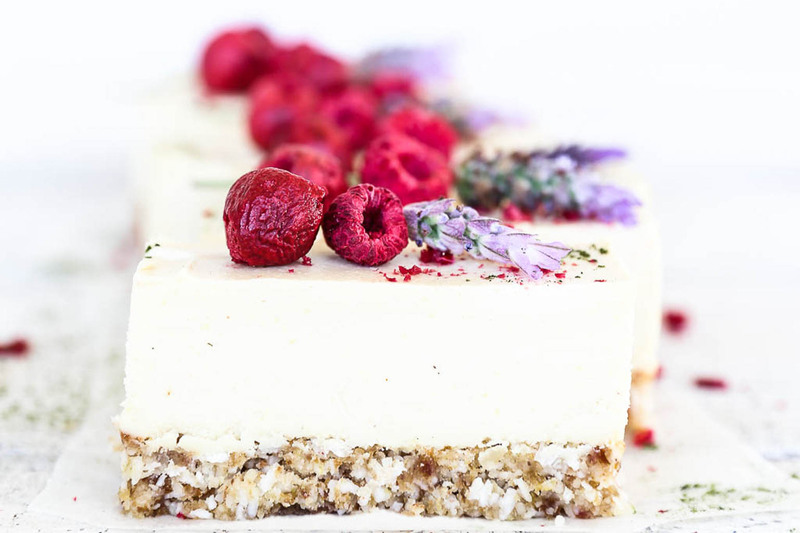 Next melt the white chocolate and pour into a small paper piping bag. 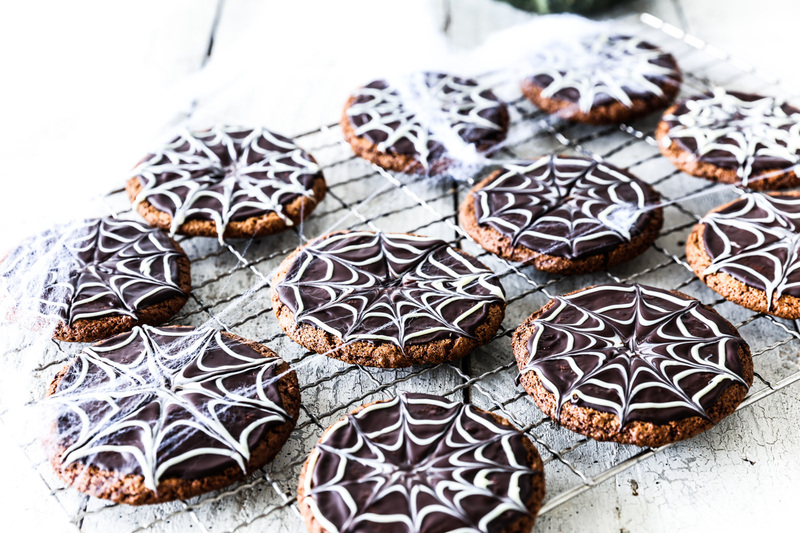 Pipe 3 circles on each cookie and use a knife to draw lines out from the centre to create a spider web design. Once the chocolate icing has set, store the cookies in an airtight container at room temperature for up to a week.